It's time to get the right studio microphone for your new home recording studio setup. This is one of the most intimidating decisions facing most novices due to the sheer number of options available. Type "studio microphone" into a search engine and you'll be greeted with an avalanche of vendor-related links, but no real help finding the one for you. But this is why I'm glad you're here. 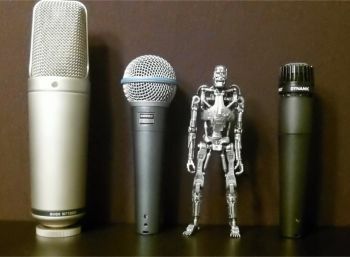 Here's my collection of mics that I use in my own studio. Don't make the mistake I did... one of these mics is actually from the future and has been sent back in time to try and change the past. "What Am I Trying to Record?" So in short the first 2 will be best recorded with a condenser mic, which is more sensitive and better suited to pickup the nuance of your performance. On the other hand, 3 and 4 are best recorded with a dynamic mic, which is better equipped to handle the stronger pressures associated with those outputs. This is the first mic I had in my own personal setup - mostly because I didn't know what I was doing and listened to a bunch of other people. I know this is blasphemy in the world of dynamic mics, but this is the mic I use the least. So what kind of person should look to this mic option? Basically someone looking to record an amp or drum set. I was looking to record my acoustic guitar / vocals and this guy left me discouraged. Just like you wouldn't try to drive a nail with a saw, I was using the wrong tool for the job. So if you visit another site (why??) and see something like "The Shure SM57 mic is the greatest mic ever created in the history of the cosmos" (or something like that) just check to see what type of inputs they're recording. You could put a foam cover on it and use it very effectively to lay down the boom-badoom-boom-boom-badoom-boom-super-bass of the rap song you're collaborating on. Just don't think it's the essential 1st microphone for getting started. This is beautiful marketing on their part but just isn't true. It all depends on what you're trying to accomplish, which leads me to my next guest. So what I'm about to say is going to sound hypocritical, but here goes. I absolutely love my Shure Beta 58 mic. Why is this such a contradictory statement? Because it is 90% the same as the Shure SM57 shown above. Now I play piano and I use my Beta 58 to record my vocals while also recording my keyboard directly to my audio interface. This allows the performance to have a more "live feel" because I've found that sometimes when I record music and vocals separately, I tend to over-do one or the other. When I'm performing both at the same time it can have a slightly rougher sound which I dig for many of my recordings. In any event, this mic has one main difference from his friend the SM57... the grilled mesh around the sensing element. This pop-filter is why this mic is preferred in a live setting, but I think it comes in very handy in a home recording scenario as well. Finally, this mic has a hot output which is great because it sends a stronger signal to your mic preamps before being boosted. Overall, this is one bad mamma-jamma that you can have a lot of fun with. At $330 this one may be out of the price range of people just starting out, but I use this mic the most of any in my small collection. It's used in my acoustic guitar recordings, vocals, voice-overs for my video reviews, and to record sound FX. The Rode NT1000 has a good weight to it and sounds clear and clean. This mic attaches via a threaded screw that is super smooth, and fits snug and tight to the mounting hardware. Overall this is just a beautiful microphone. The only thing to keep in mind is that unlike dynamic mics, these guys require phantom power. You really can't beat the versatility of a large diaphragm condenser mic, and for this reason I recommend one as the first mic purchase in a new home studio. If you absolutely know for a 100% certain fact that you will only be miking your over-driven Marshall Amp then by all means grab a Shure SM57 like you'll read on a dozen sites. But if you're not quite sure yet or want to record a variety of things, but really only have the cash for one mic then go with a large diaphragm condenser. Also be careful not to crank the gain too hot on these because they are very sensitive. A little boost goes a long way and you don't want to introduce noise into your recordings right off the bat.